My girls love animals and they dream to have pets at home so they can take care of them. We used to have 2 lovely Persian cats but unfortunately, they are not with us anymore. We don’t have a real pet at home now so the girls dream with pretend pets for now. That is why we love Little Live Pets by Character as they have lots of fun products such as birds, butterflies, mice, fluffy pets, frogs, etc. 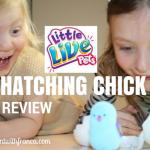 We recently reviewed their Hatching Chick which the girls were fascinated by. 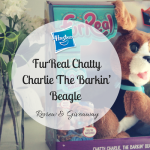 This time we received one of the latest products from their Little Live Pets range. 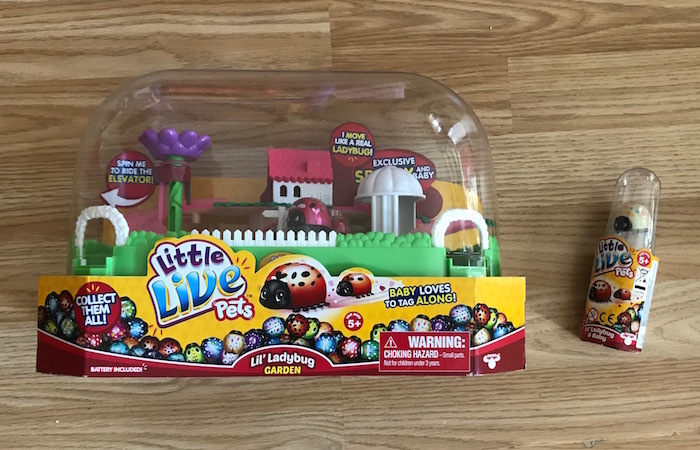 We got the Little Live Pets Lil’ Ladybugs Single Pack and Ladybugs Garden Playset. My girls like seeing ladybugs when they are outside, they find them really pretty. These ladybugs are so adorable! They are so tiny and cute that my girls fell in love with them straight away! 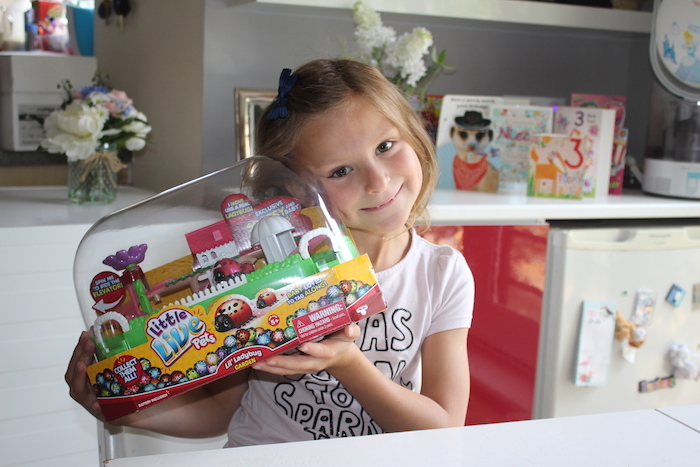 I opened the box with Bella as it says that it is for kids aged 5 and over so I thought it would be more suitable for her as she is 7 years old. But I also wanted to check first to see if it could perhaps be suitable for Sienna to play afterwards with supervision. 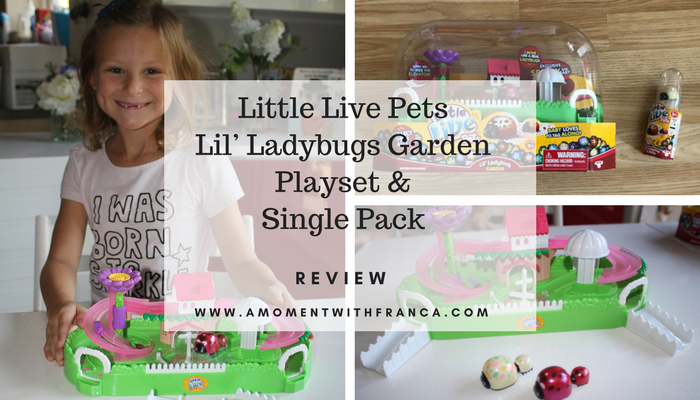 The Little Live Pets Lil’ Ladybugs Single Pack is the perfect present for my girls! They fell in love with Lil’ Ladybugs! They move, play, and are so beautiful just like real ladybugs! 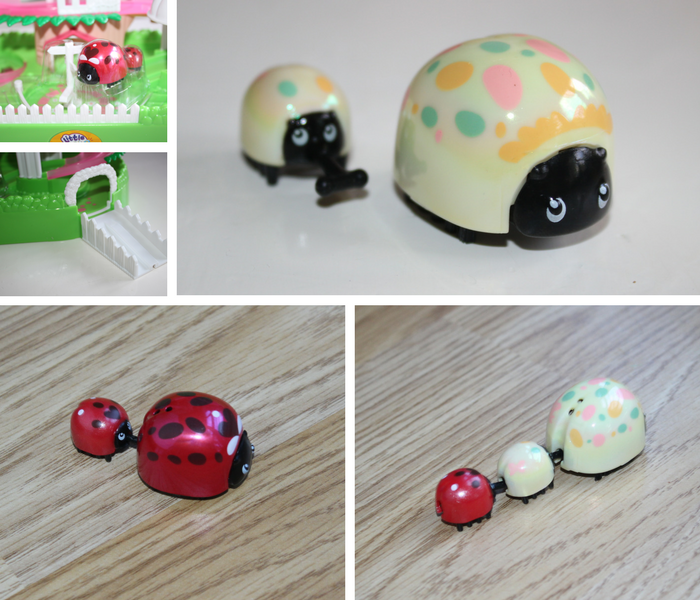 The ladybug comes in a cute dome jar style packaging to display the ladybug in once you have finished playing. One is supplied. 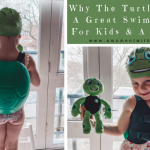 I didn’t realise about this so ours went to the bin, what a shame but if you got one please keep the packaging and don’t make the same mistake as us, so your little ones can display the ladybug. One of the things that I love the most was that batteries are included. At the start when we opened it for the first time I was worried we wouldn’t be able to play but it was a relief to then read that the batteries are included, so this is great. The Ladybugs come with small bristles which act as their legs. If you turn the ladybug upside down, you will see the switch to turn it on and off. Turning it on makes the Ladybugs start vibrating which helps to make them move. The little baby ones come with a long antenna which you can click onto their Ladybug mum so they can be pulled along. There are 12 super cute ladybugs to discover and collect, each with their own distinct pattern. You can collect Shelly Bug, Tiny Angel, Snowbug, Dizzy Daisy, Princess Dotty, Bug Heart, Bug Beam, Teeny Ballerina, Berry Bug, Boppy Bug and the rare one’s Rainbow Spots & Lil’Sprinkles. They come in a variety of beautiful colours with a shiny finish. Each has their own baby bug that they can pull along, some even have twins! OMG, they are just so cute! Bella was so excited to see the mummy ladybugs pulling their babies along! We got the Teeny Ballerina Ladybug and her tiny baby! It has a lovely design and it is so colourful and beautiful. Your little ones can collect them and build up their bug family! Bella loves it so much! They also have rare characters, so now we are after those as they look so cool. 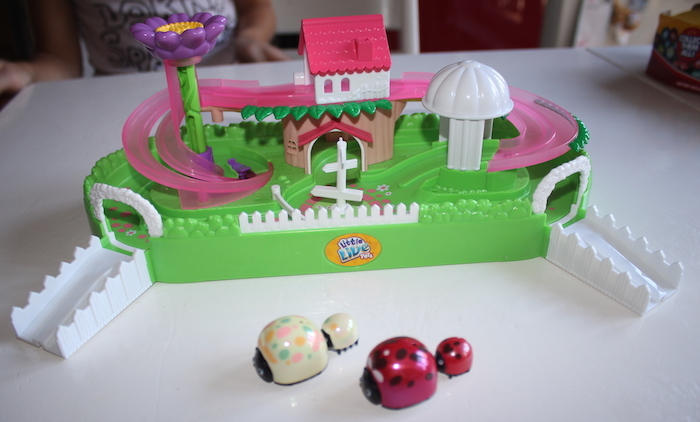 The Little Live Pets Ladybugs Garden Playset is so much fun. It is very easy to put together. It only has a couple of ramps to attach to the main set on each side which will help the ladybugs get out of the garden. This adorable playset is a wonderful miniature world for these cute ladybugs to explore. It is mini in size but as you can see big on fun! Your little ones can spend hours watching the ladybugs scoot in, out and all about their little land as they play and discover new ways to go! Included in this playset, is a lovely ladybug and her baby. We got Spotsy & baby. Spotsy is a little pet bug who loves to tickle and hug. She is super smart with a great big heart. She will never fly away without you. Such a cute little thing. Bella decided straight away that she wanted Spotsy & her baby for her. So we thought that the Teeny Ballerina would be perfect for Sienna to play with. 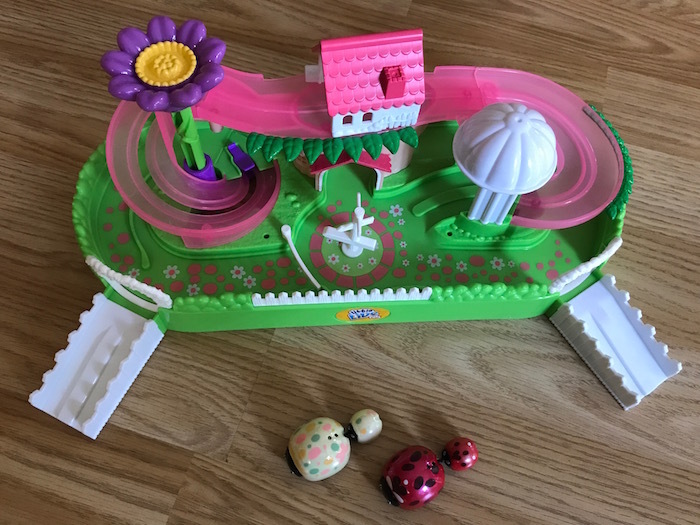 One of the fun things to do that this playset offers is that you can spin the flower and watch the ladybugs go up, down and all around in their own little town. 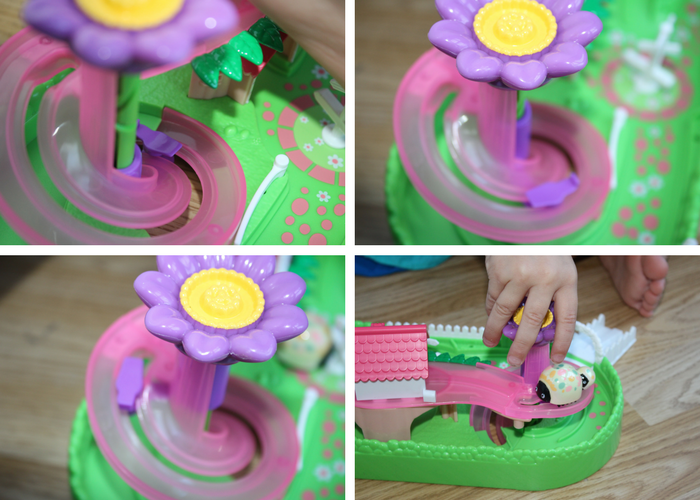 The Ladybugs should be attached to a small hook which will help to lift it up when you spin the flower. This is a lot of fun. Both my girls love doing this although sometimes it got stuck and needed some help from me, however, most of the times they were okay to spin it. The booklet says that it should not be a toy for children under 3 years old as it contains small parts. Sienna has just turned 3 so we thought she should be okay to play but of course, I was supervising just in case. She loved the playset and the ladybugs and she plays a lot with it. She definitely needs some supervision as she tends to leave the ladybugs running around on the floor outside the playset so if you are not careful the ladybugs can disappear very quickly, LOL! I had to make sure she didn’t lose any as it would be sad if any of them were lost. Little Live Pets Lil’ Ladybugs have been a success at home. I wasn’t sure initially if they would entertain my girls more than once but I was wrong as they have been playing with it a lot. 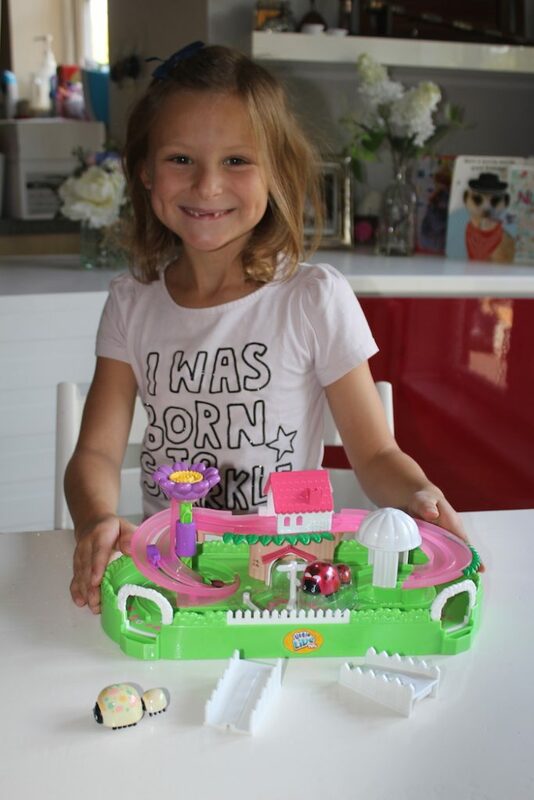 Bella who is on summer holidays has had access to it more and has chosen to play with it more than her other toys. The same with Sienna. Every day after arriving home from nursery she has gone to play with it straight away too. It has been a lot of fun for them so far! 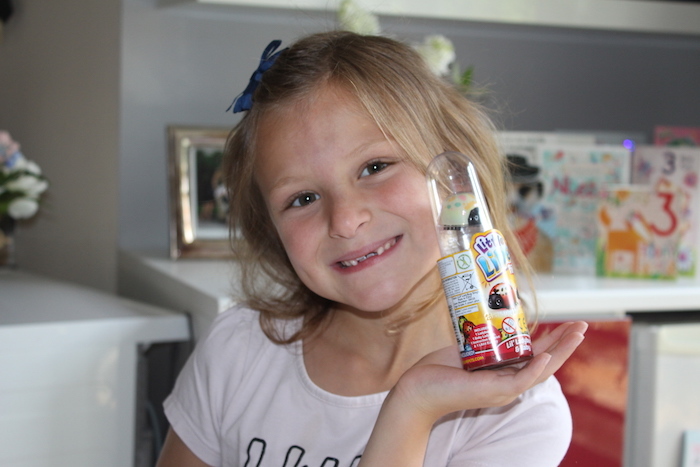 Do your kids love Ladybugs? 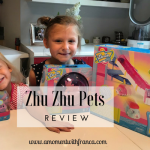 Have you heard of the Little Live Pets range? What do you think of this playset and individual pack? 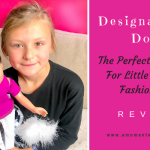 Would your kids love playing with them too? 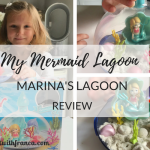 *Disclosure: we were sent a Little Live Pets Lil’ Ladybugs Garden Playset & Single Pack for the purpose of this review. However, all thoughts and opinions are my own. Contains affiliate links. Ah this looks fun! Isla wuould love these.